The Talbot Hotel is undeniably an attractive old building and has almost certainly played host to some notable figures from the past. However, one might describe its inclusion on Nights in the Past as being by proxy. Indeed, this Grade I listed structure (a status which makes it one of the most precious pieces of architecture in the country) is thought to be partly built from stones taken from Fotheringhay Castle as a result of the inn being reconstructed in the mid 1600’s – an earlier incarnation of The Talbot existed around a century earlier. Perhaps of most interest to the history enthusiast is that the splendid staircase is reputedly the same one down which Mary Queen of Scots walked to her execution in 1587. Some even say that an imprint on one of its newel posts is that of her ring. 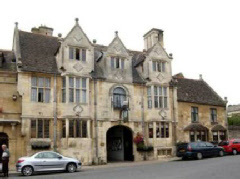 3 star rated, the hotel offers 35 guest bedrooms, of which four are suites: The Ashton, Burleigh, Fotheringhay and Oundle. The Talbot is just a short drive away from Peterborough, Corby, Kettering and Stamford. Those looking for a base from which to explore eastern England will also find that Cambridge is little over an hour away by car.